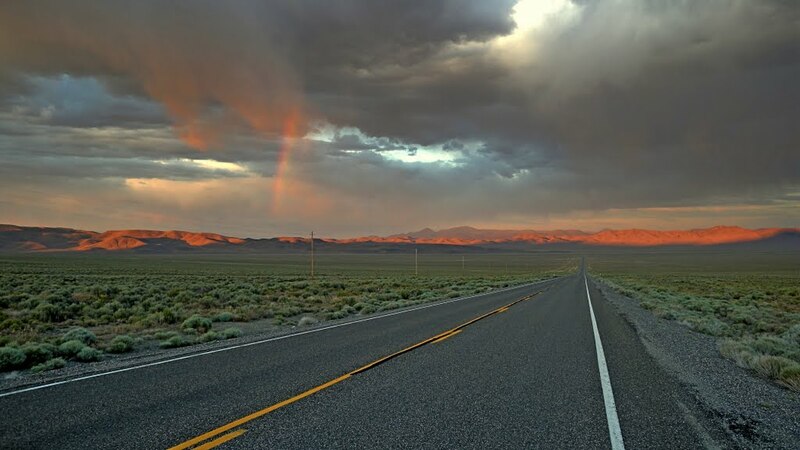 The Nevada portion of the route, named “The Loneliest Road in America” by travelers, evokes the feeling of loneliness. You find miles and miles of little more than mountains, sand, and blue sky. US Highway 50 wasn’t built overnight. 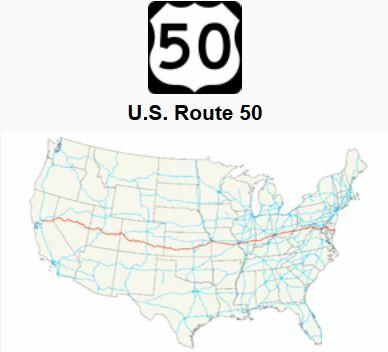 The history of US Highway 50 starts almost two hundred years ago. There were no established trails other than pathways left by the Native Americans. It’s believed that US 50 owes its existence to Captain William Bicknell. He successfully made the long exhausting trip to Santa Fe, where he made a fortune selling goods. Thus the Santa Fe Trail was established and the route that Bicknell explored became the Mountain Branch of the Santa Fe Trail. Later the railroads would follow Bicknell’s Santa Fe Trail establishing routes that someday would become a part of US Highway 50. Today as you travel through the towns and countryside along US Highway 50 be on the lookout for sights of the highway’s past. There you can still find some old gas stations, motor courts and diners hidden between newer buildings and businesses – a glimpse to another time in America’s past. My wife and I drove U.s. 50 from Carson City, Nv. to Utah in 1992, the year I retired from the Federal Government (Pentagon). A very interesting and beautiful drive. We enjoyed it so much and always wanted to drive it again. We are up in years now and chances are slim we will ever do that again. I tell everyone that you need to drive across this beautiful land at least once before you move on. We were very fortunate to drive it 4 times from Myrtle Beach South Carolina to California. This is a drive everyone should take in their lifetime. Thank you very much for posting such beautiful pictures of US 50. God Bless America. I totally agree, I am originally from England & have driven across country 4 times from Florida to Nevada, taken several different routes. Every state has it’s own signature & should not missed off your bucket list! 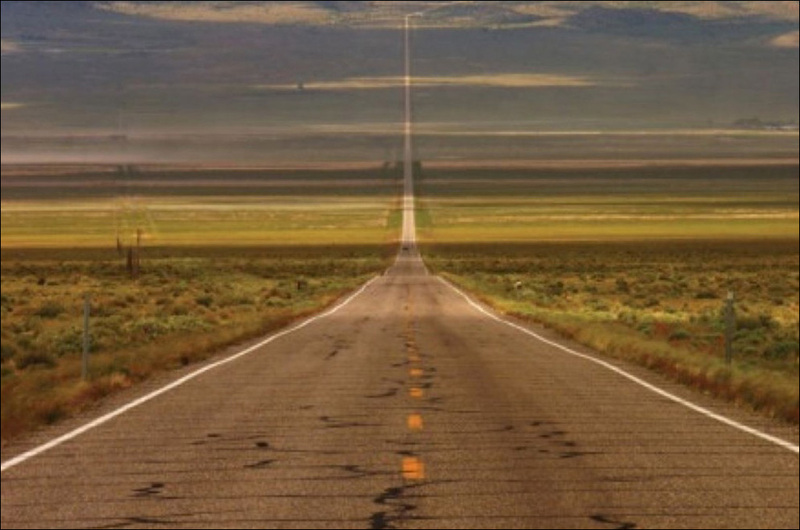 I drove this road from Fallon to Sigurd Utah at least 7 times back in 2007. The first time I did it just to “see what was out there”. I expected to see a desert wasteland and got the exact opposite. It was one of the most beautiful drives I’ve ever seen, so I kept doing it. There are huge stretches of smooth straight road (wound up doing 120 mph and didn’t realize it ) followed by twisty mountain roads. I think you cross about seven mountain ranges while crossing Nevada . My favorite part was the last gas station just before the Utah border. I’ve never heard anything so quiet. This was followed about 55 miles later by a site that made me skid off the side of the road and stare: notch peak! Second highest vertical drop in the continental US, and out in the middle of nowhere. I will make this drive again before I die! Thanks for posting those stunning pictures. I have been Googling on the drive for more than two years now. I have never been to America, but still haven’t given up my dream to visit this wonderful place on earth. I hope my lifetime drive will come true, and sooner. Best wishes from Bhutan! I hope you make it one day. I live in central Missouri – I drive Hwy 50 every day. My husband and I take driving trips every few years to different parts of the US – avoiding the Interstate highways as much as possible and enjoying the lesser highways. It is so diverse in beauty! Many thanks, Paula. I’m now in Perth, WA doing my post-grad. Will be here for a year or so after which I hope to do the Hwy 50. Cheers to you and your husband! – Take lots of pictures and enjoy! Lovely to see your post. I’ll share two things. First, my family and I had a truly wonderful visit to Bhutan in 2001. My children were 3 and 6 at the the time and we were traveling for four months. Without exception, people were kind, welcoming and helpful and it made our visit exceptional. I’d love to return, but we’ll have to see what fate holds on that score. And second, should you come to the US and embark on an exploration of the Western States, we’d be happy to return the favor and help. We’ve traveled hundreds of back roads all over the Western US and our entire family loves to get out and explore. Though I’ve driven 50 through Nevada several times, I was on this site because my wife and I and the kids, now 20 and 23 years old, wanted to take the more scenic and interesting way home from visiting their grandparents in Colorado. We are located in the San Francisco Bay Area and would be happy to host you and provide suggestions. Coincidentally, my wife and I also did graduate studies in Australia, though over in Melbourne. Good luck in your studies and travels. I have been back and forth across the USA coast to coast numerous times..We live in Carson City NV and are doing this trip tomorrow From Carson City to Baker West to East and back to Carson City and looking very forward to it…. When are you leaving? My wife and I would like to make the same trip next year. We are in Louisville KY. When are you planning on doing this trip? Going as a group? We are from Louisville ky as well and would love to do this trip on my harley. You’ve got to share your experiences. I’m making the trip on my bike (not a fancy HD, but a Honda VTX1300) in July 2017. I will leave San Diego, ride up the beautiful 395 to Tahoe then turn right at HWY 50. I’ll take it all the way to OC, MD. I can’t wait. I’ve been thinking about this trip for years. We live in Floyds Knobs, IN . My husband and I have this drive on our bucket list. Unfortunately this trip has to wait until 2023. Then you will never do it . . . take it from a very old man. Don Have you driven US 50 coast to coast ? We live in Cincinnati and are planning a road trip in 2019. We have done US 66 and enjoyed it immensely. I will be out there in July- anyone know how the weather would be? I know it will be hot in the troughs potentially…. Oh- I will also be on a Harley! We were in Kansas & Colorado in June. The weather was pleasant but we did hit some storms! I say be prepared for all seasons just to be safe! I’ve lived in the Bay Area and near Sacramento in the 90s, then near Lake Tahoe, then in Fallon, NV, traveling back and froth to Austin on “The Loneliest Highway,” then near the San Rafael Swell in Utah and now in Salida, CO since 2006. US 50 has been part of my life for years! I’m thinking it’s high time I continued following it to its Eastern terminus. I haven’t spent much time in the East since the family left for California in 1957. Now a friend is moving to North Carolina soon and wants me to visit — perhaps this is just the “excuse” I need to head East. When I get a newer car that can make it there – AND BACK – I’ll probably be on my way, staying and eating in as many “Mom and Pop” places as I can find. When I was a kid, we drove from PA to CA and back three times, some of it on US 50. I’ll bet a new trip will bring back old memories. We recently stayed at Salida & loved that town! It’s one of the few towns that makes me want to move from my home! Me and my wife are driving from Maryland to the Grand Canyon then to the red wood forest, we are going to drive route 50, can anyone tell me if I should or should not use this route? If you want to see America as it really is….Use it. The small towns, the people, the awesome geography and beauty is all there. I was on it from Kansas into Colorado & recommend using it instead of the interstates. This is the only way to go. I would hope you take in Mesa Verde and then spend a few days in Moab, UT to visit all the National Parks and then drive through Monument Valley to the Grand Canyon. As a history major I love to travel on roads filled with history, route 50 is one of those roads. I have driven it from my home in Ohio to Ocean City, Md and on other occasions ventured west as far as Utah. People who stick to the interstates are missing an experience that is full of beauty and a wonderful education of America. I’m from Scotland and my boyfriend is French. We are both very keen on driving West-East across America and as this route seems to encompass most of our most desired places to visit, it seems like the ideal choice. Any info that you could give would be a great help and would just be great to hear from people who have done it really! I recommend easily budgeting no less than $100 daily. Most hotels are $100 & up nightly. I recommend camping along the way. There are numerous books & websites which list campgounds. You can camp in your vehicle or pitch a tent. Public lands don’t usually charge. Just make sure you know where you are! I highly recommend a National Parks annual pass if you plan on visiting any while here. $80 covers everyone in your vehicle. We recently visited 5 parks at $25-$30 per vehicle. Having the pass saved us $$! Pack a cooler with what you want to eat/drink in order to save money. Gas stations/convenience stores/fast food restaurants charge about $2 per nonalcoholic beverage. Most local grocery stores have delis so you can stop in for cheap eats. Walmart gas stations (Murphy oil) usually have the least expensive gas especially if you get the gas card which discounts it 3 cents per gallon more. Using your smart phone & apps can be great but remember that you might not always have cell service. I had a phone which used AT&T towers & had few problems. But nothing beats having directions written down on paper if you can’t get the phone to work! I also like to stop at each state’s visitor center to get free maps & helpful tips. Using the rest rooms there or at “Rest Stops” is usually quicker too. I think there’s a Road Trip book which covers this interstate & has good suggestions. I am thinking of doing this with my family in June of 2018. Any suggested campgrounds along the way? We will be catching 50 in St. Louis, MO and then returning to California. Thanks for any tips! Also, my mom uses Triple AAA auto club which provides detailed travel guides plus can get discounts for you at hotels. Online reservations for hotels are usually the best rates but ask for discounts such as AAA, or whatever other affiliation you may have. I was on I50 from Kansas into Colorado in June 2016. I hope I can do this once in my life. Absolutely mesmerizing. I bicycled this highway last year and it was absolutely amazing. I will say that it is correctly labeled, there were times that it was over 2 hours between cars. The longest was 2 hours 45 minutes. Many days of bicycling of 70 or more miles between towns. I’m thinking of a trans American charity ride for breast cancer research when I retire in 18 months time (my wife suffered it but has since recovered) Do you think highway 50 is a viable route? I currently don’t cycle but do run around 20 miles a week so am reasonably running fit, but as yet not cycling fit. Any tips ? Are Harley-Davidson / Authorized Rentals dealership in Chicago is planning a guided trip along Route 50 – coast to coast. It was great hear all the wonderful tales and memories of “the Lonliest Road in America”. Our trip will be fully guided with the option to rent a new Harley-Davidson. We will be getting the tour up shortly on our website. Check us out at http://www.WindycityMotorcycleTours.com. Definitely the trip of a lifetime! Hello I drove Route 66 in 2011 on my motor by myself and this was really great . Now I like to ride Route 50 Westbound in 2018 . I have to start in Ocean city and have to hire a Harley. Do you know an affordable company . Thanks. I plan to drive the r50 in september 2018. Did you find a good renting company in OC ? 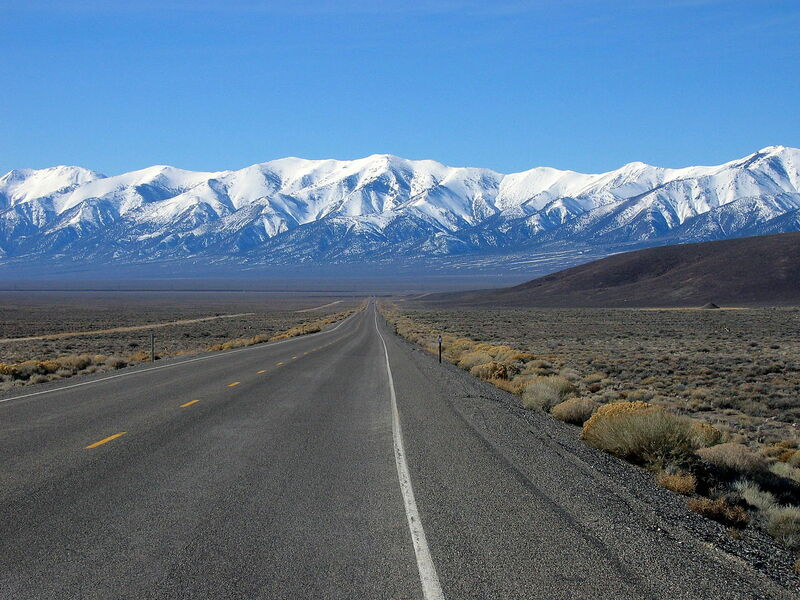 Thinking of driving route 50 from Utah to Carson city end of March. Wondering about the road conditions, we are from England and love driving in the USA. We did a route from Boston to San Francisco a few years back. Can I do the road from Great Basin to Lake Tahoe? Is it recommended? 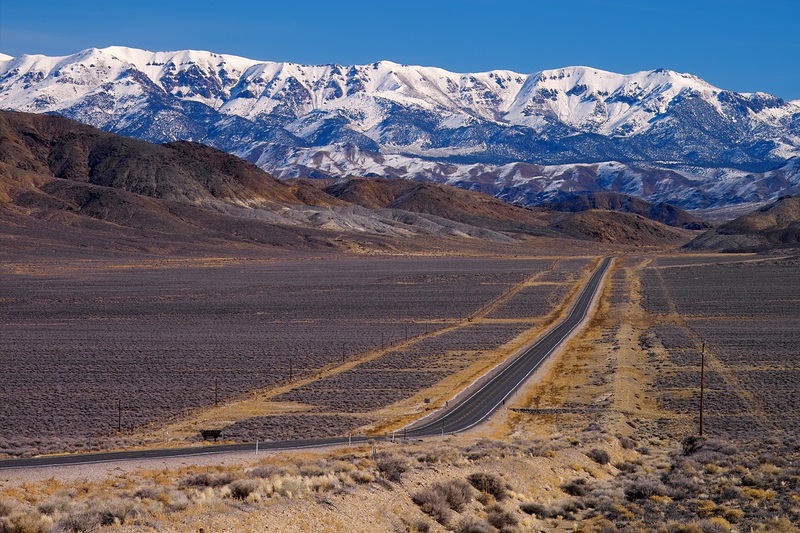 Rt 50 is a clear and safe route to take from The Great Basin to Tahoe. Of course make sure your have properly prepared in case of break down. Have your camera ready and enjoy the ride. How much time do I need to save this drive? Is it fine to do it in one day? Is there any places in the road to stop? 1-	Budget is king for professionals. The more I spend on the road the less I bring home! The less I bring home the more my wife send me back out to make more money!!! 2-	A good cooler that plugs into your car lighter will save hundreds in food cost. You can always find microwave heaters in quick stops and hotels. I eat out only once every other day or so. And when I do I spend a little extra because I have saved so much more with the cooler. 3-	Map/GPS Maps are a must, GPS is a luxury. A good quality map will get you out of trouble when the GPS goes on the fritz, and they all go on the fritz eventually and some regularly. GPS’ LIE too. They all have some fouled up programming hidden within their brilliant minds that seems to rear its head at the most in-opportune time. They are good but maps are a must. You can use a map tp plan in to the future as well. Rand McNally makes a sheet protected US map that you can use again and again with white board markers for your rout planning. Don’t get me wrong I love my GPS, but I would never leave the house without my map! 4-	Fuel APP. I use Gas Buddy. I can save about 20 to 70 cents a gallon with some planning. First I am not afraid to top off even if the tank is 2/3 full and I will put a 10 in just to get to a better price. But you have to realize that fuel is my number one cost. Saving 10% is huge in business. I also spend 100 to 300 dollars a day on fuel. 5-	Hotels. I am a Hot Shot driver. That means that my pickup does not have a sleeper. Like most travelers I stay in hotels along the way (24 night a month on average). I budget 70 a night for hotels across America and I spent an average last year of 64.3 dollars a night. I stay in 3+ rated hotels but they are nothing to write home about. National chains like Motel 6, Super 8, etc. are in this range. So I don’t do dives and I don’t do Hiltons, but I do require a safe clean room. I am also willing to stay 40 miles away from my destination to find a better deal on the room, knowing that I will have the extra drive the next day means that I just need to plan a little better. I use a hotel finder app like Hotels.Com regularly but not always, there are plenty out there and you might even be able to gain a free night now and then. I never limit myself to chain apps as that cuts down on the pool in any given area, and some of my best deal have been the Mom and Pop type stays. 6-	MOST IMPORTANTLY – BE PREPARED! Be prepared for anything! Have a sleeping bag or blankets, some food and plenty of water with you at all times. I cant tell you how many times I have pulled over to help someone to find that they don’t have anything in the car for an emergency. A small tool kit, blankets, maps, water and rations are a must for all travelers. I have begun a 200 mile round trip and been forced to shut down on the side of the road for three days once. Luckily I was prepared and knew the forecast, road conditions and emergency procedures. I also had a couple of good books to read. NEVER PUSH THE LIMITS OF YOUR DRIVING SKILLS! Get a room and wait it out. 7-	If you can, travel buddy’s are great. A second car can go get fuel, parts, or emergency cell service. Cell service you say… there is always cell service. Not so my inexperienced friend. There are, what I like to call, 100 mile black holes all over the nation. Believe me, I know, I travel a lot of them. And there are many places like TEXAS where the local service may not provide your carrier a piece of their bandwidth. BE PREPARED! A buddy can get to the next town or get you to the next auto parts store if he is there and has another mode of transportation. I drive regular from Fallon NV to Pueblo CO and love the drive. the continued portion through Utah and Colorado are just as if not more impressive, but not as lonely. The drive over Monarch Pass at well over 11000 feet is very impressive. I left the notes above just to jelp road trip planners with a few of my professional tips. hope they help! I live just off US 50 in Maysville CO, about 10 miles west of Salida. I have driven the road many times from my former home in Sacramento to Maysville. I love the drive, even the Nevada portion. Starting Tuesday, I am going to drive from Maysville to Indiana on HWY 50. Picking up my new Palomino cab over camper in Indiana. The unit was $3,000 cheaper there and no sales tax to pay. Can’t wait. Was hoping to make it all the way to Ocean City MD but not this time. Don’t want to fight the east coast traffic over Memorial Day weekend. I officially want to travel this now! I think even more than the original Rt 66! Maybe I can get my husband to make this next years road trip! We always take a 30-day road trip every July for vacation! I just drove the Nevada and part of Utah part. Awesome. Myself and a friend are contemplating a road trip from Illinois, near St Louis, to California and back on touring bicycles. After reviewing this website I will most definitely present Highway 50 as an option. Anyone with a thought about this, whether optimistic or pessimistic, would be appreciated. This was one of the greatest and hardest rides I have ever done. The desert in the summer is brutal. However, there are exceptions. If you plan on hotel biking then your load will be so much less and doable. If you bike this in the fall or spring then it is very enjoyable. They are maps for bicyclists and are bike friendly roads. Just purchase the maps you need. My wife & I are planning to follow Hwy 50 from Sacramento to Ocean City. Where is the beginning of the highway in Est Sacramento? Is there a sign marking the western end? There will be signs throughout Nevada. We just came home from a road trip that included the Nevada portion of Hwy 50. Just a tip, stay on top of gas (I’m sure you’ve heard that before with this stretch.) Once you hit Fallon your only options after that are Austin, Eureka, and Ely. Ely and Fallon will probably be the cheapest of the four. I have a very fuel efficient car, but I filled up in Ely when I headed westward and then filled up again in Austin and Eureka. My gas gage never went below 3/4 of a tank, but I didn’t want to take any chances because it was just my kids and me (my husband was not on this trip), cell service is not always reliable out there, and I didn’t want to get stuck in a situation where we were on the side of the road in the heat. It definitely is the “loneliest road”!